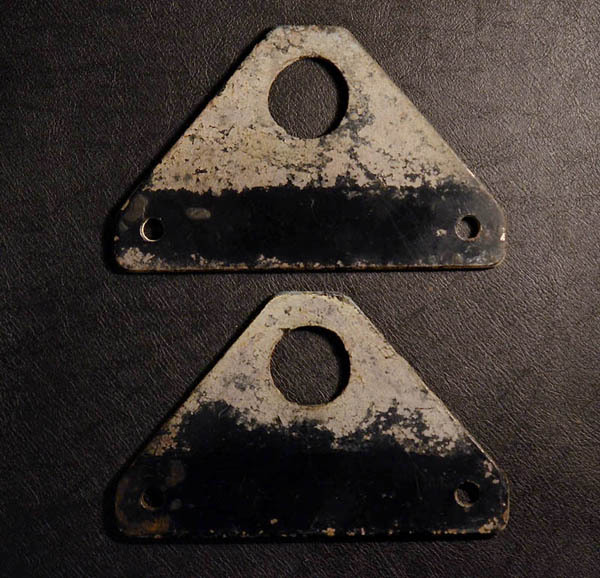 A pair of metal Jensen Interceptor transportation brackets as removed from Jensen SP 131/4952. From what the Museum understands, these so-called transportation brackets were fitted temporarily to Interceptors / SPs. They were removed from the rear assembly of Jensen SP 131/4952 during mechanical renovation work in 2005, where they had been in place since the car was built. 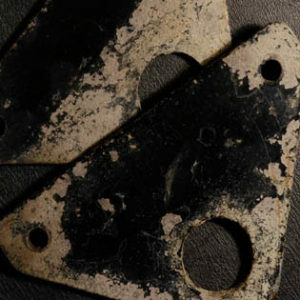 Pair of transportation brackets as removed from Jensen SP 131/4952. The term transportation brackets is obviously a rather loose description. What isn’t known, were the brackets put in place during the assembly process, or when the car was being transported to distributors. Since most Interceptors inspected, do not have these brackets in place, it is a fair assumption, that they were to be removed at the point of car completion, or delivery completion. By some oversight, they were left in place on 131/4952, remaining in place for nearly forty years. The brackets are manufactured from steel, measuring 18.2cm x 11.3cm at the longest and widest points. They have a thickness of 0.6cm. Once machined, they have been sprayed in a gloss black paint. NOTES: The Jensen Interceptor Transporation Brackets were denoted to the Museum by former owner of Jensen SP 131/4952, Brian Berkin. COPYRIGHTS: Images and text copyright The Jensen Museum.